Cherrie in Eureka Springs, Arkansas. After enjoying a yummy BBQ breakfast in Kansas City, we hit the road and headed south toward Arkansas — Northwestern Arkansas, to be specific. Since we really don’t get the fall colors at home, we thought it would be nice to get a taste of them in the Ozarks. And we weren’t disappointed, as the leafs were just starting to change, and Cherrie really enjoyed the ride. We even had time to stop along the way and explore a bit. 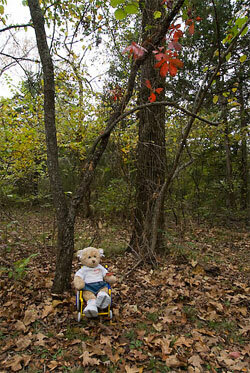 Cherrie had a fun time playing in the leafs, and learning about the different kinds of trees that grow in the Ozarks. arriving at our destination for the night — Eureka Springs, Arkansas. town itself is quite hilly, and sidewalks with curb-cuts are lacking in most areas. be much more difficult for someone in a power wheelchair. Springs, and most folks had problems finding a truly wheelchair-accessible hotel. access features of a property before you book a room. restaurant on the premises, which is located very close to the accessible rooms. All in all, it’s a great place to stay if you opt to explore this part of the country. have to search them out. Oh and another word of warning ? don’t rely on GPS in Northwestern Arkansas. before we slow down to explore some stops along Historic Route 66.